If you don’t know me, you might think is going to be a shameless plug for associate credit card links. But if you know me, you probably know what I consider the most valuable piece of plastic in my purse: my library card. First off, I pay $81 per year for the privilege of using the library and I intend to get my money’s worth. Secondly, the library exemplifies an original sharing economy. It’s environmentalism, frugality, and minimalism circa the 17th century. These concepts aren’t new, they’re just recirculating with things other than books, movies, music, audiobooks, video games, puzzles, puppets, games, robots, and electronics. That’s right–all that and more may be available at your local library. Confession: I used to do something insane. I used to buy every book I wanted. Sure, I bought them used on half.com or other discount sites. I loved books, I was an English teacher, and I valued books, so I bought them all. Then I ran out of shelves. Which drove me back to my favorite place since childhood. The library. And I learned how to get nearly every book I want from this wonderful institution. Before I go any further, let me address the common objection: Of course there are books you should buy and own. I still buy books. I buy them if no libraries in my state have them (which is pretty rare). I buy them if I just really want to own that particular book, or maybe it’s a workbook or devotional or reference. I buy books that I got from the library and wanted to read again, and deem worth of shelf space. You want to highlight? Underline? Make notes? Get a notebook. Write down the most important parts. Write down page numbers. You’ll remember it better if you write it down than just underlining. Make a copy of the most helpful page or two. You’ll find these faster than if you had to search through a whole book. If you’re tempted to copy every other page, you’ll know you need to buy it. I can’t tell you exactly how to get almost every book from your library, because it varies by state. But I can tell you some avenues to explore and questions to ask your librarian. If you want a hard copy of something, inter-library loan is the way to go when your library doesn’t have it. Ask your librarian about the inter-library loan system. Ask if you can search college and university libraries as well as other public libraries. On my local library’s web site you can go right from your catalog search results to view the holdings at nearly every library in the state by clicking on the inter-library loan system. Then you request it by submitting your library name and personal card number. The best value in inter-library loans is textbooks. After my freshman year of college I bought very few textbooks because I found them through inter-library loan from other college libraries. I was able to renew the books for a whole semester. I’m sure availability of up-to-date textbooks will vary with different courses of study, but for education and language arts topics, I found lots. Libraries know digital is the way to go now. Ebooks, audiobooks, movies, and music are all available digitally. Apps like Hoopla, Libby (formerly Overdrive) and Freegal make borrowing digital media easy. And automatic returns means you couldn’t get fined if you tried. Libby has a limited number of copies, so you might have to sign up on a waiting list. Hoopla has no holds. Both allow a certain number of borrows per month per library card. Freegal allows you to stream albums or songs and temporarily download 3 free songs a week. There are many good children’s materials available this way, as well. Digital audiobooks frequently saved my sanity last year. I’d stream a Boxcar Children audiobook for my son’s afternoon quiet time and he’d be happy as clam in his room for up to 2 hours! I’ll leave you with the words of Arthur (the Aardvark): Having fun isn’t hard when you’ve got a library card! How much do you love the library? What other awesome library apps are out there? I’ll have to admit that now that my kids are older, we barely go to the library now. We use to live at the library! Our library has such a great kids area, and has so much to offer. I need to get back into the habit of going for myself, and taking Emmy more frequently. But a nice little side effect of taking the kids all the time when they were little is that Morgan, who is 18 now, goes to the library by herself on a regular basis to check out books. I love how that aspect of utilizing our local library has been passed on! I’m sure it’s hard to get there when you’re busy. That’s great your adult daughter is going there on her own! The habit stuck. Yes! The library card is the most valuable one in your wallet (besides maybe your health insurance card $$$). I’d like to point out that on top of all the services you mentioned, our local public library also shows films every month for free. It might be a Hollywood classic, a foreign film, or an absorbing documentary that we would normally never think to borrow. Plus they host author talks and so many activities for young & old. They publish the schedule each month–maybe yours does too. Worth checking out! Yes, there are sooo many services I didn’t even get into in this post. We just came back from story time, and there are classes, films, clubs (Lego club! ), children’s parties and more. I’ve recently gone back to the beloved library too after many years/decades forgetting about ’em! I think the VIP Pass is joining The Friends of the Library (or whatever the volunteer fundraising board is called). Ha! I’ve been a library fan all my life. I’ll admit that the Kindle has moved me a bit in its direction. The idea of carrying my favorite hundred books with me every where I go is just too enticing. You can get a ton of Kindle books from the library–without physically going there! It’s nice that libraries are catching up with more digital offerings. It is awesome for travel especially so you don’t have to lug around tons of books. The only other app I can think of is the 3M app. My particular state has a digital media library through them as well. I haven’t heard of it. I do wonder how much varies by state. The library I used to go to had a $100 fee for families who didn’t live in that township (or maybe you had to be a city resident to borrow for free?). My parents quit going there and just switched to a smaller library without a fee. Then they bought a rental house in town and the fee disappeared so they switched back to the bigger library. I think that’s one of the reasons that even frugal people don’t go to the library as much anymore. Why pay money for books when there is just so much free stuff online? Non-fiction readers have blogs, Youtube, and a ton of other resources for learning. Fiction readers have just as much free content available through Amazon, Book Bub or other promotion sites.You can get a LOT Kindle books for free and never have to leave the comfort of your own home, let alone pay a yearly fee. I’m just referring to the fact that we all pay for libraries through taxes. I didn’t know some had an upfront fee! I should have been more clear. The “fee” is property taxes, which everyone pays one way or another (I’m sure it’s rolled into your rent). Just trying to make the point that we do pay to support the library, so all the more reason to use it. That’s awesome yours is only 2 blocks away. And yes, both growing up and now the library was a great place to enjoy A/C on hot days! Ah! I remember that song from Arthur – from when my kids watched it. (I’m sure you remember it from when you watched it yourself.) I run our school library, and every year, we get huge donations of books from people who have run out of shelf space in their homes. Some are downsizing, and some are just fed up with the clutter that too many books eventually create. I grew up in a home with stacks of books, so I always considered it somewhat sacrilegious to try to throw out, donate, or otherwise release books. Just this past spring, my siblings and I had the job of dealing with all of those books from home when my mother moved into a retirement home. We kept very few. Most we had to donate. So they sat for literally decades on my mom’s shelves for no purpose as it turns out. That was a wake-up call for me. Yay for librarians! 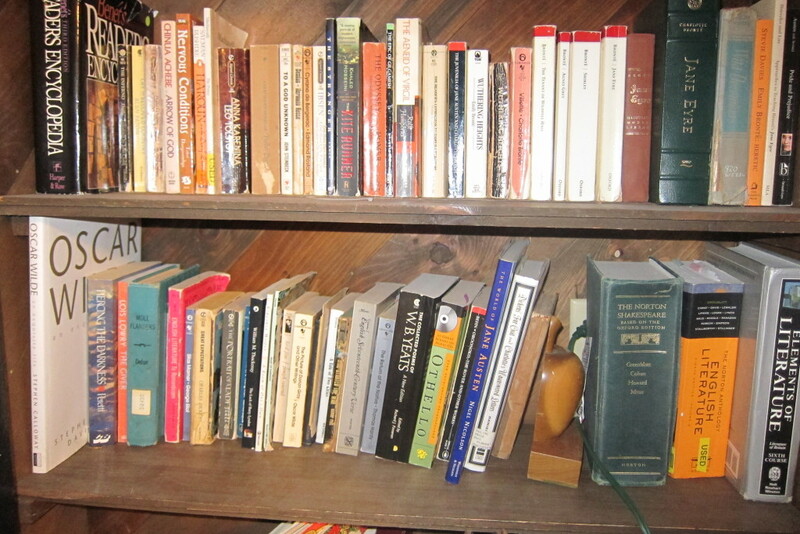 Yes, I also considered books nearly sacred for years until I realized how many I didn’t re-read (while others I did). I started getting rid of some of those, especially ones I know I can get at the library. But the English teacher in me just wants some of the classics sitting on the shelf. I hope having those readily accessible will encourage my kids to read them one day. I do love how the library allows us to access so many materials without adding permanent clutter–or sometimes any clutter if you’re using digital materials. Those college books we hang on to sure don’t end up being very useful or worth much a decade later. Wow, I didn’t know some libraries were offering kids lunches in the summer! That’s great they’re keeping up with the community’s needs. The library is a lifesaver with kids. I really like keeping my daughter supplied with good reading material every 2 weeks. Books have already taken over my house (I worked for a used bookstore company for many years) without adding a ton more now. Oh wow, it’d be dangerous for me to work for a used bookstore company! For little kids, I also love that our library has puzzles, puppets, and interactive kits the kids can play with. I don’t usually check these out (because I don’t want keep track of it) but it’s a great change from their toys at home. Agree! I feel so rich when I have a stack of library books ready to be enjoyed and a kindle with a wide variety of checked-out titles. While i make every effort to get holds picked up and books returned on time, if I miss a deadline and have a fine to pay, it never bothers me because it’s going to a good cause. While I was a late adopter of the e-readers, I do like them for traveling and reading at night. I find, however, that I don’t remember that I’ve read some e-books because I never see the cover like I do with printed versions! The library is the best deal around! I agree that paying the occasional library fine is no big deal considering it helps the library and compared with how much I’ve saved from borrowing instead of buying. I have just started getting ebooks from the library now that I have a smartphone and tablet, but I still prefer paper copies. i love the library. Being able to access Chiltons car guides online make it much easier to repair my car if needed. Great idea to access car guides for repairs! yes I also have a stack of old university books that haven’t been cracked open in years. Just like your comment above.